Every day is different. I have a daughter who has cancer and I take her to chemo and radiation 5 days a week. I generally get 2 to 4 hours of painting done in each day. My studio was designed and built as an addition to my home, with lots of windows and light to paint from. I started painting when I was around 5 years old and am still going strong at 76. It gives me more reason to get out of bed in the morning. As most artists would say, “the next painting is my favorite.” However, I did a painting last year for a woman that lost her daughter to cancer, and when she received it, tears came to her eyes as it had touched her. Ice cream, love, and painting. 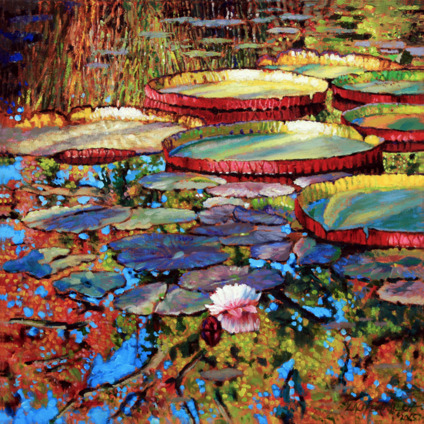 Nature has always been my inspiration, especially water lilies. I have already achieved what I wanted to do and that is to be an artist. Visit John's artist page to commission a nature-inspired piece of art now. To view all his works, visit his personal webpage.